The faction now known as Prometheans was founded by Dr. HR Cornish. When humans on Earth were preparing to launch the first generation ships into space, many scientific teams jumped at the chance to revolutionize space travel. One stood far above the rest: the scientists led by Dr. Cornish. It was his team that discovered how to convert Unobtanium into a highly potent and efficient energy source using Cornish’s Theory of Relative Thermogravimetry. 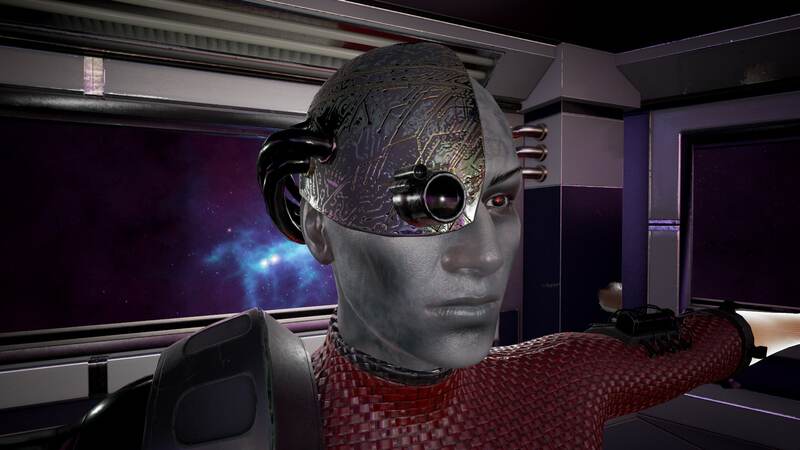 Dr. Cornish’s team was awarded the Order of the Prometheus for their groundbreaking work, and they were among the first outside of the flight crew to be allowed to reside inside one of the giant generation ships. 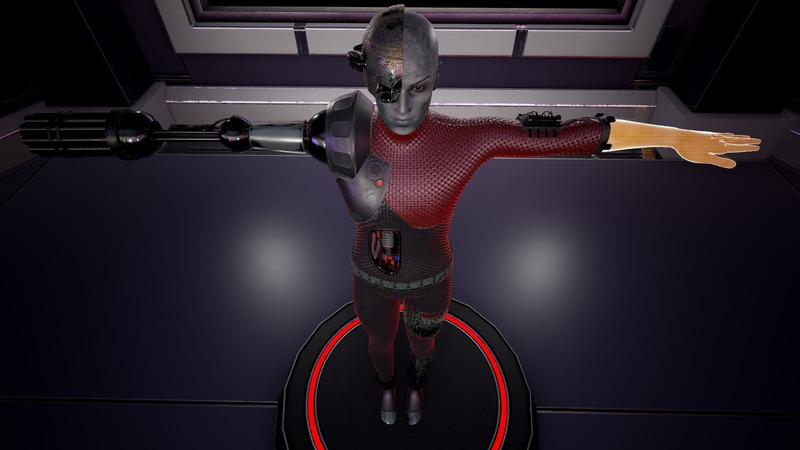 The research team decided to settle aboard the FHS Justice, and eventually branched into studying robotics and cybernetics to improve the lifespans, quality of life, and powers of humans aboard the ship. Their early products attracted a devoted following of life-hackers and scientific zealots who basked in the seemingly limitless potential of mechanical enhancements. But Dr. Cornish wasn’t satisfied. Unobtanium provides incredible energy at large scale, as in the ship engines. But it is hard to use efficiently on smaller scales, and harder still to manually adapt it to biological entities. 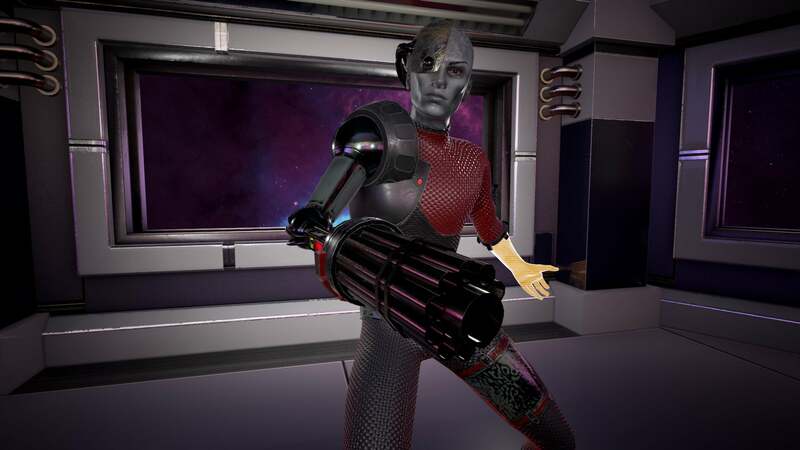 Cornish’s cybernetics work had vastly improved the performance of individuals, but even cybernetically-enhanced humans did not match abilities of the best heroes on the ship. Dr. Cornish was determined to find a way to bridge the gap and allow ordinary humans to match or exceed the powers of the supers aboard the Justice. At a loss for answers in conventional physics, he turned to magic, and worked for decades to find a way to artificially merge arcane energies with his cybernetics. This new focus drew a different crowd of admirers than his prior work had: it drew in occult revivalists and others who believed that magic was worth studying even in an era of incredible technological advancement. The idea was brilliant, and arcane cybernetics are still commonly used on the Justice today. However, no one knew back then that certain kinds of magical energies which are safe on their own have terrible side-effects on the user when mixed with non-biological systems such as cybernetic implants; Dr. Cornish was the first person known to combine the two in implants, and the first user of his own inventions. The doctor slowly grew more reclusive and paranoid, until only the members of his original team closest to him and the most devoted of his admirers saw him even occasionally. Rumors spread about his lack of appearances; some claimed he had retired, others said that he was researching the next big thing. A few even claimed that he was doing nefarious and inhuman experiments to try and ‘out-progress’ the increasing number of super-humans being born aboard the FHS Justice, although most thought that idea was crazy. A founding father of modern space travel, becoming an inhumane mad scientist? “Life is not a comic book,” quipped one unfortunate news anchor. The truth came out when several screens in public areas of the FHS Justice simultaneously broadcast an unexpected message. The video they showed was slightly grainy, and all that could be seen was a blurry, mechanical figure. It spoke in a grim monotone, calling for a populist revolution. FHS Justice Ship Security was immediately dispatched to investigate the message. They arrived at Cornish’s private lab, which had developed an ominous air, the lab was found to have been looted and abandoned. Over 40 of his colleagues were missing, along with Cornish – and upon further searching, so were over a dozen citizens known to have admired his work. Ship Security spent years looking for any sign of where the missing citizens might have gone – or been taken to – but they were never found. With no further leads, the investigation was eventually closed. To the surprise of many, the members of Cornish’s original team who didn’t disappear continued their research unharmed, leading to a variety of breakthroughs in cybernetics. Centuries later, the story of Cornish’s end and his Prometheans are considered by the average citizen to be an urban legend. Some even believe that the video was merely a scare tactic meant to distract from the kidnapping and eventual killing of a beloved scientist and his team by madmen or criminals. But for those with a security clearance high enough, the truth is far more worrying. After studying what few notes remained of Cornish’s later research, it is clear that the man wasn’t kidnapped or killed, but that he had instead gone totally insane. Going by the incomplete notes left behind in his lab, Cornish’s work had combined unstable arcane energies with advanced cybernetic implants. Super-humans with the ability to sense magic were able to determine that nothing Dr. Cornish used was inherently evil or mentally degenerative by itself, nor were robotics or cybernetics on their own inherently evil or mentally degenerative. But Cornish’s addition of unstable magic to his devices created consistent results: slowly-growing paranoia, delusions, and eventually, aggression towards anyone who did not also use the tainted cybernetic technology. Cornish’s blueprints were destroyed, and the remaining cybernetics in use were replaced by safer and more stable configurations, but problems remain. Prometheans have been sighted occasionally ever since, and their appearances are rapidly becoming more common. Ship Security even intercepted a second Promethean transmission recently, preventing it from being broadcast. The message claims that the Prometheans’ spiritual leader is still their active leader, in whatever form… but those are unconfirmed rumors, and Cornish has not been seen in living memory. If he does still exist in any form, he certainly isn’t human anymore. For most people, a disappearance aboard the ship is merely a police matter, likely the result of a kidnapping or a murder, or possibly someone caught in the open by a Nagdellian raid. But for those in the know, the question always remains: which crimes are the work of Prometheans? Rumors of secret tunnels and hidden labs, hidden by Cornish in the early days of the ship and undetectable by the security forces, run through the population. Even the uninformed know that far too few Prometheans have ever been caught to think all of them are dead – and what research was left suggests that a person doesn’t have to be willing in order to be turned into a Promethean. What if their numbers are growing? 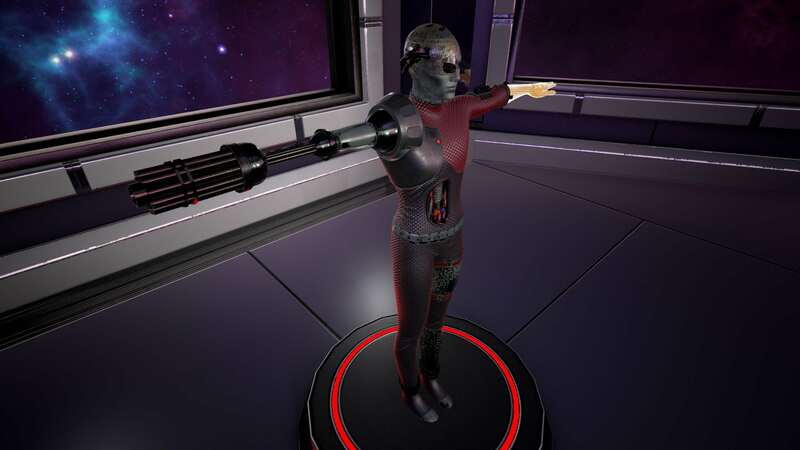 The Promethean Firebrand is an advanced melee fighter who has willingly replaced much of her body with cybernetics in order to maximize her combat capabilities. Like most Prometheans, she has retained at least one complete biological arm and hand so that she can potentially masquerade as a normal human with the right clothing. 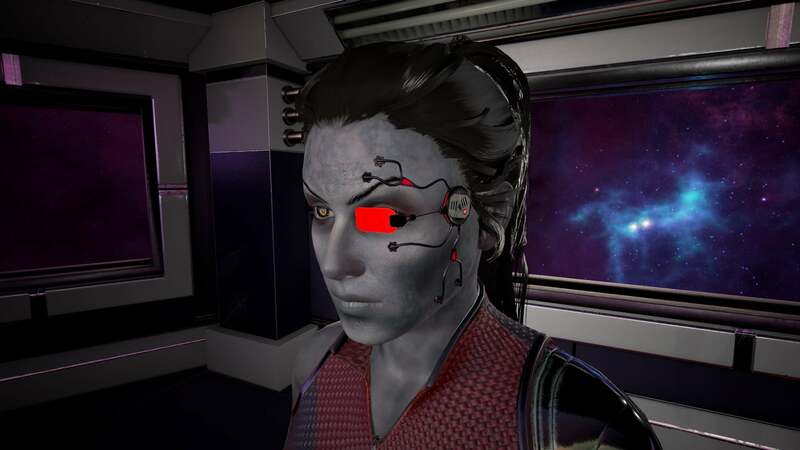 While she has replaced both eyes with cybernetic eyes, she has also enhanced one eye with an external sensor grid to increase combat accuracy. 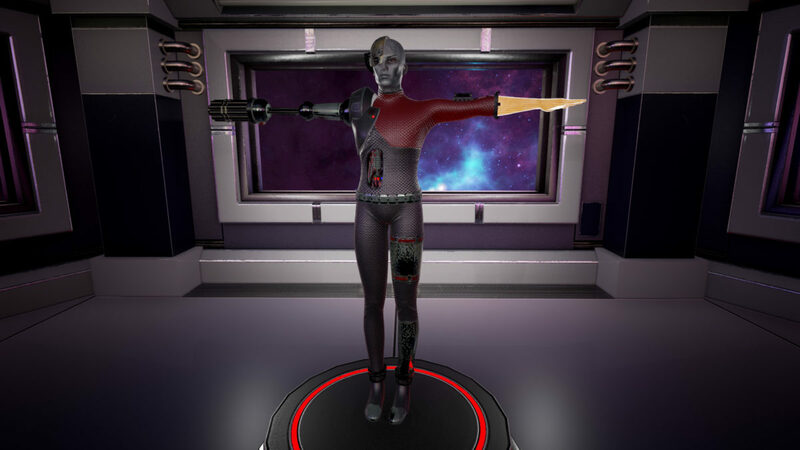 The overall shape and design of the cybernetic body replacement parts keep closely to the original human design to facilitate infiltration missions. However, up close the legs are clearly neither biological tissue nor standard cybernetic replacements. 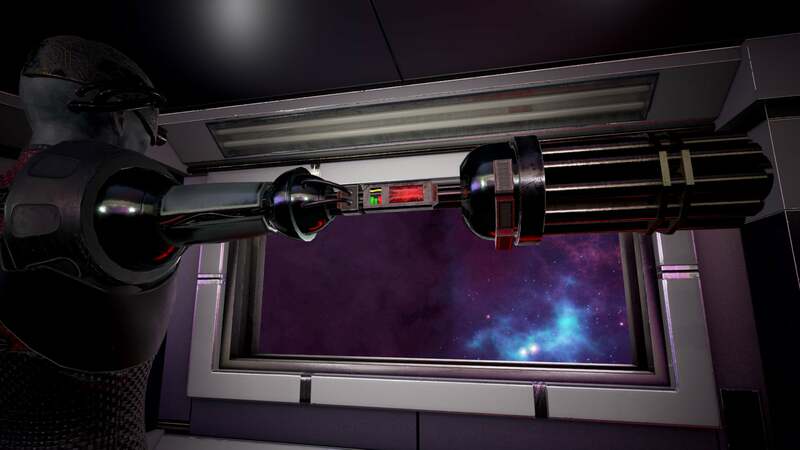 This is an example of the combat technology of the Promethean Insurrection. The Promethean soldier is the basic combat model of the Promethean Insurrection. He has basic modifications making him more powerful and much more damage resistant than a standard human, and giving him a powerful and accurate long range attack. Many soldiers are also able to sense and apply dark magic, giving them an additional set of offensive and defensive powers. As such, each soldier is slightly different than the others. This model of Promethean has the ability to apply some dark magic powers from his remaining biological hand. The gun arm relies solely on advanced tech for its offensive power. Despite significant body enhancement, most Prometheans retain the majority of their core organs and functions, only enhancing themselves in ways that allow them to confront and defeat superheroes. The rapid-fire arm gives the soldier a long range attack with ammunition that is accelerated to extreme speeds, allowing for small ammunition size and no need to reload during a long engagement. Soldiers are mentally as well as physically enhanced, and know no fear. In this Latest News we are showing an asset (the Assault Mech) that we purchased. It is not uncommon for studios such as ours to purchase a model here and there along the way to speed up the development of the game. However, just purchasing an asset is not all it takes to use the asset in a modern game engine such as UE 4. 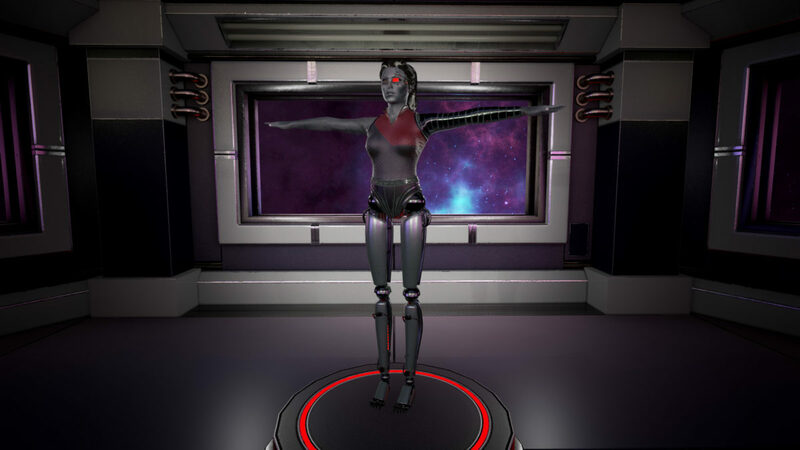 Many modifications have to be made to an asset, including aligning the animation blueprints with the system we created for Ship of Heroes, changing the surface to be PBR for higher realism, and scripting the robot so that it actually interacts with players in an MMO environment. But the two human-cyborg characters were entirely created and refined by our art and prop teams over the course of a couple of months. Ultimately the Prometheans were created in the dev-version of our CCT. The manufactured arms, legs, eyes, etc. of the Prometheans were all created specifically for Ship of Heroes. 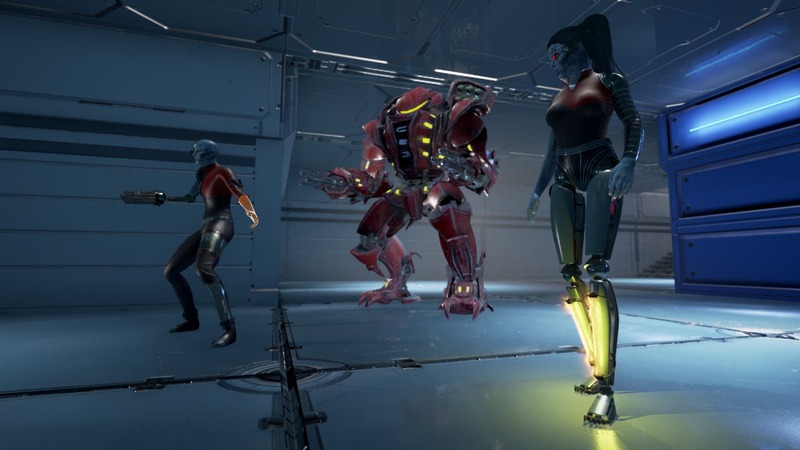 For example, a player can see through the legs of the Promethean Firebrand below because her legs are sophisticated props – we did not begin with human legs and just dunk her lower body in cyber paint and call it good. Before Ship of Heroes launches, we expect to expand the ranks of the Prometheans with additional types of enemies. But these first examples will be frequent opponents of the heroes, and do illustrate the art style for this group. In our view, unique art assets should be part of any MMO.